Mobile devices such as smartphones and tablets are experiencing a tremendous growth in sales. Its use in various applications are gaining popularity. Manufacturers vie for attention and market share by developing features and technology guaranteed to catch the consumer's eye. Apple alone sold 172 million of its mobile devices (iPad, iPhone and iPod) last year, 2011. One notable feature users look at is the display screen. Screen size is important since bigger screens can display more data and bigger images. A standard smartphone range from 3.5 inches to 5.5 inches (Samsung Galaxy Note II). An iPad screen stands at 9.7 inches. There are also different types of screens. They range from the often used TFT-LCD screens to the various flavors of Super AMOLED screens. Even Apple has marketed its display screen naming it "Retina Display" which is basically a high density screen that does not pixelate at all. But aside from screen size and screen type, it seems another screen feature for mobile devices may be in the horizon; 3D screens. 3D screens are already being featured in high definition LCD screens. To capitalize on this, there are movies released in blue ray and DVD formats that support 3D viewing. Most require the use of 3D glasses to fully appreciate the experience. Imagine a mobile device that visually displays a street map and whose screen physically mutates to show the hilly terrain and buildings. A team of scientists, led by the University of Bristol, have developed a new type of screen display that not only moves but also physically tilts. Researchers from the University's Department of Computer Science will present the display, called Tilt Displays, at MobileHCI 2012, the world's leading conference in the field of Human Computer Interaction (HCI), held in San Francisco, USA. Tilt Displays is a display surface about half the size of a standard tablet, such as an iPad. It consists of a collection of individual display components each of which can tilt along one or more axes and move vertically up and down. This ability to tilt along multiple axes distinguishes it from previous actuatable displays. 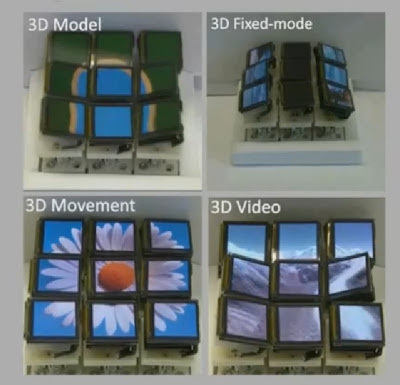 The researchers, through a mobile 3x3 custom built prototype, examined the design space around Tilt Displays, to understand users' initial impressions and looked at how users may interact with these surfaces. They were also interested in the use of a mobile display, because of the range of opportunities for its use it offers. Sriram Subramanian, Professor of Human-Computer Interaction in the Department of Computer Science's Interaction and Graphics group and co-chair of the MobileHCI 2012 conference, said: "The ability to tilt along multiple axes distinguishes our display from previous actuatable displays. Such screen versatility opens a range of opportunities for providing an additional integrated information channel to the user. "These opportunities include collaboration, terrain modeling, 3D video that is beyond auto-stereoscopic 3D and tangible gaming. We can imagine many scenarios that would benefit from the physicality offered by Tilt Displays. However, we need to establish whether users can relate to the new experiences and advantages of using such a device." The research found participants were very positive about the Tilt Display concept. Their first impression was to associate Tilt Displays to a new method of presenting and consuming 3D content and they linked the Tilt Display to other forms of 3D displays, such as those used in cinema. The second user study examined two interaction possibilities, one for manipulating the surface of the Tilt Display and the second for conducting everyday interactions. A set of six gestures were employed to control all facets of tilt and actuation. The second set, for the low-level interactions of panning, scaling, rotating and selection, found that users preferred on-screen gestures for planar surfaces, but mid-air versions of the same gestures for non-planar configurations. This demonstrates users' ability to 'scale up' their knowledge of gestures to the domain of Tilt Displays.